Perched high on a hill this 127 year-old residence would have had superb views of the New Farm/Teneriffe area and the Brisbane River on its completion. It was called Blenheim by its owner, JG Johnson, a civil engineer who owned the property until its sale in 1893. 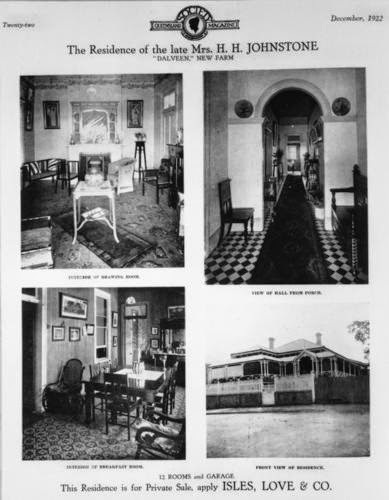 The following images of the interior of the house known by that time as Dalveen, consisting of 12 rooms and a garage, were taken for a later sale of the house in 1922 and show the opulence of the residence. "This majestic colonial residence was built in 1887. Set high on the hill, with commanding street presence and views over the suburb, this house is one of New Farm's most admired residences. Blenheim House features wide open verandahs opening onto landscaped lawns and gardens. Plaster internal walls are rarely found in timber houses, which clearly sets this home apart from its peers. 2 marble fireplaces, wide hallways and arches, separate sittings room and dining room all add to the grandeur and spaciousness of this property. If land is what you're craving, then this 1,037 (over 40 perches) will satisfy your heart. A salt water pool has been added to entertain your children. The sale of this property will cause great interest, so interested parties should contact this agent as soon as possible." 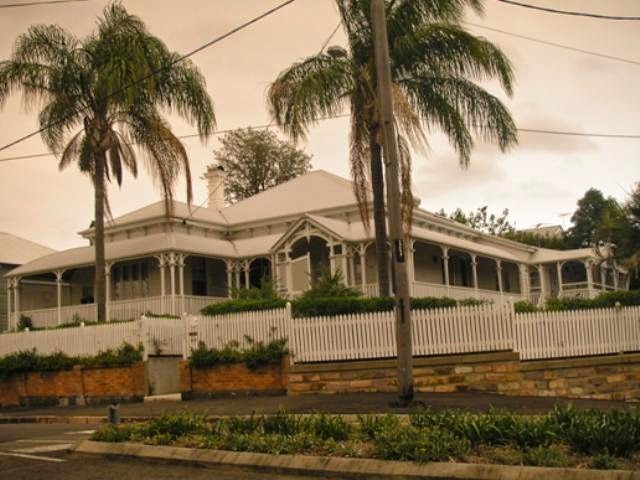 The house is now listed on the Brisbane City Council Heritage Register, and this is their photograph from 2011. The house itself is a bit harder to see these days as it is surrounded by a growing hedge, but it nonetheless remains an attractive addition to the area. Good to see that you are back Foto Fanatic. I love your work, and enjoy reading about more about Brisbane.